So begins The Adventures of Huckleberry Finn and if I obey the author my review will be limited in scope. However Mark Twain tended to ignore rules he didn’t like and so I will follow his example rather than his dictates. 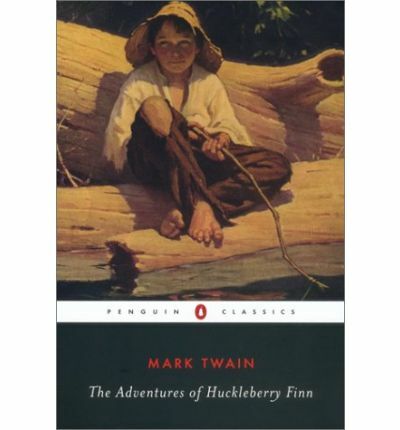 The character Huckleberry Finn was first introduced in Tom Sawyer, which I haven’t read for several years. I remember him as a disreputable boy who liked to live wild with little respect for others. In the beginning of this book that is the boy we meet, however by the end the character is much more developed and hence much more interesting without losing any of his charm. The plot is that Huck escapes life with his father by pretending to be dead and sets off down the Mississippi in the company of an escaped slave, Jim. He encounters many adventures on his travels including a feud between two families that has killed more people than anyone cares to remember; a band of murderous robbers on an abandoned steamboat; a floating house; a hopeful lynch mob; and a ‘duke’ and a ‘king’ who are two of the biggest charlatans you could ever be unlucky enough to meet. The last two sell Jim, which upsets Huck mightily since he considers Jim to be ‘his slave’ or at least that of Jim’s escaped owner, a widow in Tom and Huck’s hometown. And rights to own humans is what a fair chunk of this book is about. Huck is under no illusions by the end that Jim is a friend, but he can’t let go of the fact that Jim is also someone’s property. Huck has been taught that his loyalty lies with the owner, but deep down inside he is uncomfortable. Twain clearly outlines the moral choice presented to a good person in a society where the slave owner’s rights are paramount. In the end Huck, abetted by Tom Sawyer. decides to help Jim escape from his imprisonment. Twain also cleverly balances his (non) message with his sense of fun, which runs throughout the entire book. In places I was laughing out loud – and that’s unusual. Tom’s ‘help’ is more of a hindrance because of his insistence that all aspects of the escape must be consistent with tradition. In particular, readers should watch out for the exchange between Tom, Jim and Huck about suitable animals to provide companionship to Jim during his interment. I have two minor criticisms of The Adventures of Huckleberry Finn. The first is that some of the characters, while entertaining, are just too ridiculous and especially too credulous. The second is that it took at long time for the book to develop a sense of direction. This might be why Twain warned against looking for a plot. There were no clear signposts of what was to come and I found this slightly disconcerting. Overall, an excellent read with interesting thoughts to ponder and a great sense enjoyment.